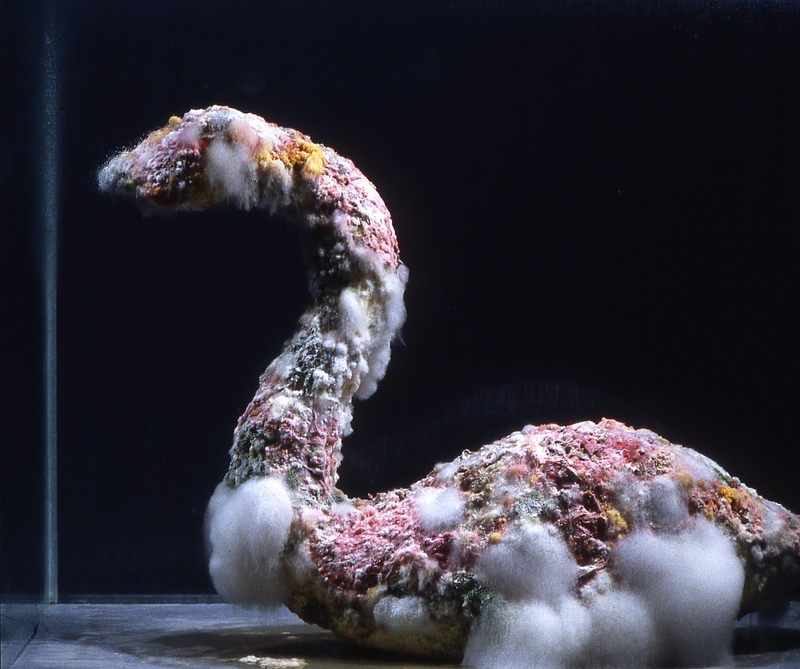 The Swan is a process based art work with selected living microbes growing on a Swan like scaffold. Over the course of several weeks the growing microbes start to resemble the flesh and feathers of a Swan. Kares search for identity motivated him to work with microbes and make use of the imaginary and symbols he found on the way of his journey to answer his question “What explains my biological self?”. He started to work with scientists to select and breed certain microbe species with specific aesthetic qualities. The Swan not only symbolically points to our origin but also reminds us that also humans have a life long symbiotic relation with a large range of micro organisms coexisting with us in our guts and our skin. And so when we talk about human identity it is not without a doubt if we can speak of a self or of a colony and where in our environment our bodies start and where they end. The act of collecting microbes in Koli exemplifies the shift if not a break on what level we approach nature and landscapes today as it takes places in the iconic Finnish national landscape. It was the same place which inspired many Finnish painters and composers like Jean Sibelius, Juhani Aho or Eero Järnefelt to do their today well known work. The Koli microbes extend the artistic palette of Antero Kare and found their way into his living artworks. Antero Kare (FI) is an artist curator and teacher based in Helsinki Finland. He is considered as one of the pioneers of bioart. From 1985 he has produced “living art” by microbes and chemicals. Kare has shown extensively in Europe and the USA. He has been elected to the board of the International Art Critics Association, founded the New York Foundation for the Finnish visual artists and was the rector of Tampere School of Art and Media.